The LNB is made up of an amplifier, a local oscillator and a mixer. It's purpose is to convert the received satellite frequency to a lower one that can be fed to the receiver via usual coaxial cable. You can read more about LNBs on Wikipedia. I will only talk about universal single LNBs. These LNBs have two local oscillators (or one with two frequency outputs) that can be switched on at a time to provide either 9750 MHz or 10600 MHz. The higher frequency oscillator is selected by the receiver by sending a 22 kHz tone via the same cable to the LNB. Common satellite TV transmissions use two types of polarization (horizontal and vertical), that's why if you torn apart a LNB, you will see that it contains two perpendicular "rod" antennas inside (see also the photos on Wikipedia). Again, these antennas are selected one at a time via the supply voltage from the receiver. Feed the LNB with 12 - 14 V and it will switch on the vertical antenna. Feed it with 17 - 19 V and it will switch to the horizontal one. TV Ku-band downlink frequencies are between 10700 MHz and 12750 MHz and can be either vertical or horizontal polarized. The receiver's tuner input is between 950 MHz and 2150 MHz. So, this LNB configuration allows a 12750 - 10700 = 2050 MHz bandwidth to be received with a tuner with 1200 MHz bandwidth. Satellite receivers have a tuner output port called Loop Out. There are some which don't but you can use a satellite splitter with DC passthrough. With these installations, only one receiver can control the LNB (supply voltage and 22 kHz tone). This will narrow the number of transponders you can receive. More than that, if the master receiver will be turned off, the LNB will stop working because is no longer powered (note that some receivers power the LNB even when in standby). Another issue is that if you change the channel on the master receiver to a transponder which requires different polarization or local oscillator, the other receivers will lose the signal. 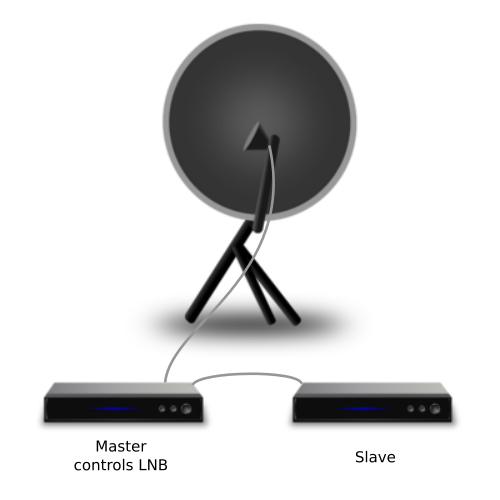 Can I use single LNB with my DTH provider? you can split the LNB signal to multiple receivers via Loop Out or with a splitter. Do not attempt to split the cable the DIY method (parallel circuit). Also do not use common splitters designed for cable TV. You need a splitter designed for satellite TV with DC passthrough that will allow power from receiver(s) to reach the LNB. However the power from one receiver should not get to the other(s)! This is sometimes called "DC backfeeding" and specs should say the splitter "prevents" or "blocks" DC backfeeding. Also the "one port passive" splitters are OK and you know which receiver will be controlling the tuner. You should request more information about the usability of a splitter for a satellite receiving installation from your supplier. There are receivers that allow switching off LNB power from their settings. I still consider hardware DC block to be safer. Not taking into consideration this, you may destroy a receiver's LNB power supply or even DiSEqC capabilities that use 22 kHz tone too and are sometimes controlled by the same voltage regulator. Nevertheless, let's not forget a receiver may have LNB power output short-circuit protected and over-current protected. Its a device bro. You can use or install it any where in the world.